HB Insider - are you a FRESH or SALT water user? This houseboat newsletter signifies the 7th one of the 2017 season, yet we've also entered our 10th year of helping houseboaters with our free monthly tips, articles, and guides. It always surprises me "how fast" life goes when we enjoy what we're doing, and I must say that the last 10 years have FLOWN BY for me. Houseboat use in FRESH or SALT water? 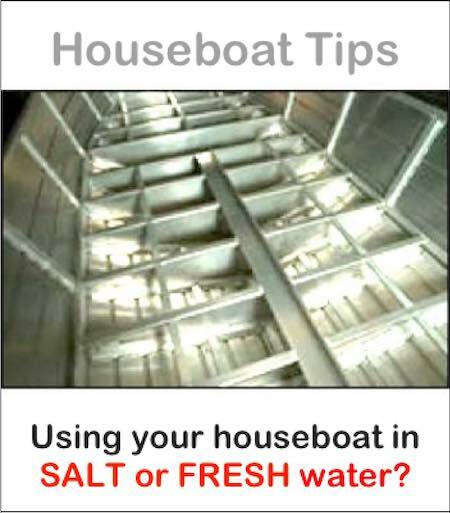 I know there is lots of confusion when it comes to about using (aluminum) houseboats in salt versus fresh water. Hopefully as a collaborative group, we can come to a much better understanding together in regards to the Pros & Cons of salt vs fresh water use. Should you, Could you, or Would you? If you're already using your houseboat in EITHER salt or fresh water, take a moment to share your experiences and tips with the group. * We're houseboat newbies, and we're looking to emigrate to Canada? * Anyone know a source for those ceiling panels used on houseboats? * What do boaters think of Castaways Marina, Inner Grove Heights, MN?